Delight your guests with personalized can coolers that will keep their hands dry and the cold ones coming! A perfect favor for all your loved ones to use at your event and then to take home with them as a memento! Welcome to Celebration Events Co! We love to create special touches for all life's celebrations! Let us know how we can help customize your event! Feel free to reach out with any questions - we are here to help & can custom design something just for you! 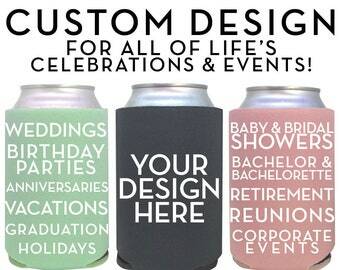 We look forward to creating custom can coolers for all your events - weddings, baby showers & sprinkles, birthday parties, gender reveals, bridal showers, bachelor & bachelorette parties, family reunions, retirement parties, and every other memorable celebration! Arrived quickly and is exactly what I ordered! Thank you! We love what our customer did with her can coolers for her baby shower! She filled them with mini champagne bottles and told her guests to pop the champagne once they heard the baby arrived! It's a gorgeous spring day here & we have added a bunch of new designs recently! Check them out! We have 7 new can cooler colors coming to the shop soon!!! I love to add custom designs to life's celebrations! I have been a professional graphic designer for a decade & it truly is my passion! I hope these custom can coolers and custom Snapchat filters add extra cheer to all your exciting life events - baby showers, bridal showers, birthdays, bachelorette & bachelor parties, weddings, and any other special event in your life! I want to help make your celebrations extra special by adding those fun details that will delight all your guests! Please don't hesitate to reach out with any questions you may have. I look forward to creating something just for you! Hi, friends! My name is Kristin and I am the owner & creator of Celebration Events Co. I have been a professional graphic designer for 10 years and can't wait to create something just for you! We have partnered with a professional print shop. They transfer our designs onto can coolers. CAN COOLERS: Can I customize the text? Yes! We can change the text to anything you want, as long as it fits in the design. If you want to change the text to something different from what is in the pictures, make sure to select “YES” under the “Proof” drop-down menu when adding the item to your cart. CAN COOLERS: Will I receive a proof? If you select “YES” under the “Proof” drop-down menu when adding the item to your cart, your proof will be sent to your Etsy messages and must be approved within 3 business days (business days don’t include weekends or holidays). To ensure that we don’t miss your important date, we will send orders to production if the proof hasn’t been approved within 3 business days. We will assume that the information you have provided for us is correct, and we will not be responsible if your information/spelling/grammar is incorrect and your order moves to production. * Make sure to carefully check everything on your proof: spelling, grammar, all information (i.e. names, dates, locations), colors, etc. CAN COOLERS: When will I receive my order? Current production times can be found in the “Shipping” section of each listing, as well as on our shop homepage in the announcement section. Production times can vary depending on the number of orders we are receiving at a given time. CAN COOLERS: Can I get multiple can cooler colors? Yes! You can choose up to 4 colors per order, with a minimum of 12 per color. Product quantities will be evenly distributed to each color. CAN COOLERS: Can I get multiple ink colors? Unfortunately, due to production restrictions, we can only produce 1 ink color per order/design. If you want multiple ink colors, you will have to submit separate orders. GEOFILTERS: How will I receive my custom Snapchat filter? GEOFILTERS: How do I upload my filter to Snapchat? Do you upload it for me? Once you receive your custom filter, you will upload it to Snapchat via their website using your Snapchat account. I will provide detailed instructions via email when I send your custom filter. You must upload your custom Geofilter to Snapchat on your own - we do not offer this service. GEOFILTERS: Where do the Snapchat filters work? Other countries are not currently available. This means if you want your filter active in Mexico, for example, it is not currently possible. Please review Snapchat's guidelines before purchasing this listing. GEOFILTERS: How much does it cost to upload filters to Snapchat? There are additional fees involved when uploading a custom filter to Snapchat. The price of the filter depends on the size of the area and the length of time you want the filter to be active. Prices start at $5.00.